It is very common for brachycephalic dogs (e.g. Pug, Shih Tzu, Boston Terrier) to present with “normal” lacrimation rates of 20 mm/min in both eyes, and yet develop corneal pigmentation, corneal vascularization, and/or infected corneal ulcerations (Figure 1). These normal Schirmer tear test values only reflect one aspect of ocular surface health in these animals. Treatment often requires an interdisciplinary approach to find the etiology of these disorders beyond deficiencies in lacrimation. The tear film covers the entire ocular surface. The tear film’s volume is distributed across the eye so that approximately 1 μl lies across the exposed surface, 2.9 μl is found at the margins, and some additional volume is found beneath the eyelid. The tear volume is spread thinly across a much larger surface area which allows capillary forces to outweigh gravitational forces. Therefore, the tear film normally stays “attached” to the ocular surface. There are three main components of a normal tear film: a lipid layer, an aqueous layer, and a mucous layer. These “layers” are not as physically discrete as once thought, but are best described as such. The lipid layer consists of non-polar lipids (secreted by the meibomian glands at the eyelid margins) and polar lipids (of corneal epithelia). This fatty layer slows evaporation of the tear film and also acts as a surfactant to reduce its surface tension. Ocular surface tension is largely the result of intramolecular forces between molecules of the tear film. A high surface tension would restrict the ability of the tear film to flow across (wet) the ocular surface. A protein called lipocalin, and certain lipids, of the tear film help reduce this tension. The lipid layer also contributes viscoelastic properties to the tear film. Viscoelastic fluids resist deformation when forces are applied to them. With each blink a tear film is tightly compressed but retains its compositional layers because of its lipids. Without viscoelasticity, sheering forces generated by blinking would tear the film apart and expose the corneal surface to harm. The aqueous layer is the bulk of the tear film. The transparent fluid of this film distributes electrolytes and proteins (e.g. antibodies, lactoferrin, lipocalin, and lysozyme) across the ocular surface. It also serves to separate the lipid and mucous layers of the tear film. Deficiencies in this aqueous layer are the most common canine tear film disorders. Diseases such as keratoconjunctivitis sicca decrease the volume of this separative aqueous layer allowing the other layers to mix. A resultant ocular discharge is often the first sign of this disease. The final and innermost layer of the tear film consists of mucus (mucins released by goblet cells) and the glycocalyx (extracellular carbohydrates of membranal glycoproteins) of corneal epithelia. This mucous layer bridges the gap between the hydrophilic aqueous layer of the tear film and the hydrophobic cells of the cornea. The mucous layer is therefore critical in the adherence of the tear film to the cornea. Its structure also traps and prevents bacteria, and other contaminants, from reaching/infecting the corneal epithelia. Each layer of the tear film can be affected by neurologic, immunologic, vascular, and endocrine phenomena. Multiple disorders can adversely affect the tear film. Diseases can affect lipid and mucin production, lacrimation, and the evaporation/spreading/integrity of the tear film. Loss of tear film stability can lead to further corneal damage, pain, and even blindness. In my next article, I will discuss how specific diseases affect the tear film and what appropriate treatment can restore ocular surface health. If you have any questions about the ocular surface, or ocular surface disorders, please feel free to ask your veterinary ophthalmologist. 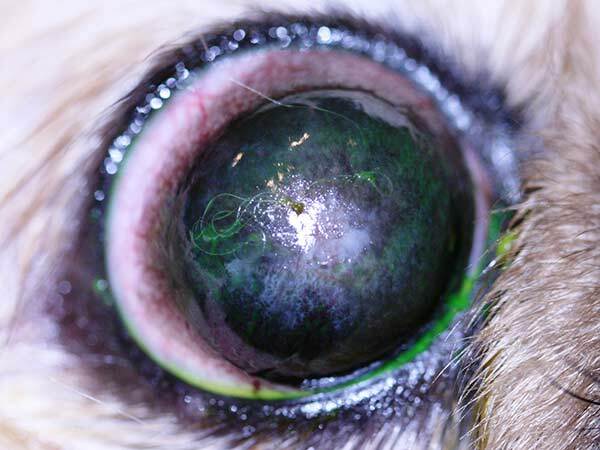 Figure 1: Corneal pigmentation in the right eye of a Shih-Tzu with a normal Schirmer tear test value of 20 mm/min.